← Guy and RAsputin – guest written post! Our project is complete! This was a lot of fun to assemble. First I made a Richard Armitage dictionary. Here are the front and back cover of the dictionary. Please click for full size. Then I turned your words and pictures into dictionary pages. Those were then incorporated into a fanvideo. EDIT: The audio had to be swapped, so the YouTube version has a jazz soundtrack. Hope you enjoy our project! If you would like to download the video in MP4 format, here’s the link: group dictionary project video. EDIT: I have set the Vimeo video to be downloadable, and it’s in high resolution MPEG format so you can actually read the text. 🙂 Here’s the link again: http://vimeo.com/39456617. You may need to join or log into Vimeo to access the download link though. This entry was posted in Collaborative Project, Fan Videos, Graphics, richard armitage and tagged actor, dictionary, fan videos, fanvideo, graphics, richard armitage, shirtless. Bookmark the permalink. Sweet! I love it. Looks fabulous, wish I really could buy it. @Snicker’s Mom: Hehe, thanks! 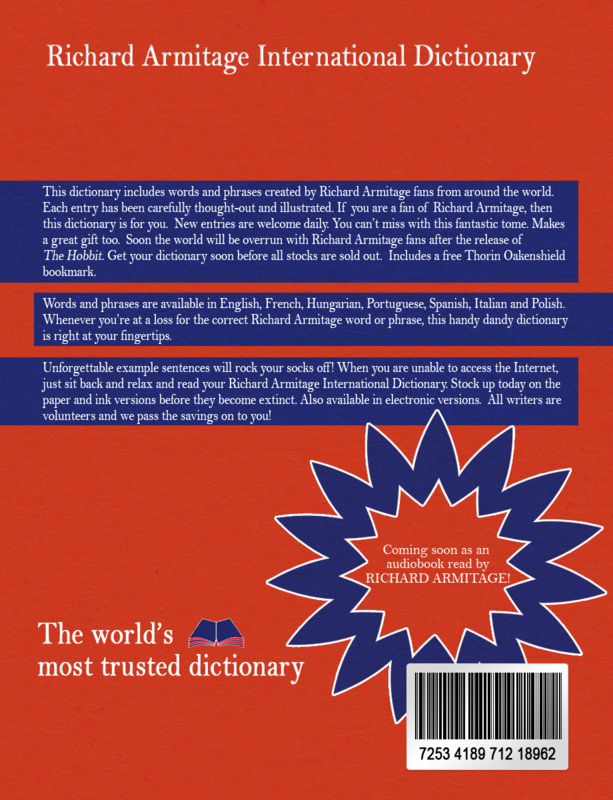 I wonder if some enterprising soul would ever write a Richard Armitage dictionary. Thanks for your contribution! I want it!!!! One for every room! I caught the word Charmitage in the dictionary too. How did I not see that one coming? I just can’t take my eyes off the pictures long enough to read the copy… But I’m sure it’s brilliant! @IntownWriter: *sigh* I know what you mean! Whenever a Richard Article print interview is published, I can’t tear my eyes from the pictures to read the words, LOL! This is awesome! It’s a shame it’s not real (but then the lawyers would spoil all the fun). Great work! Will we get a chance to read each of the pages? Then you can turn it into an App and we can all be rolling in royalties. OMG! @beengizzied: Oh that’s a brilliant idea! Now you’ve got me thinking of actually making that app! 😀 What a treat that would be. Thanks for your contributions! @Mamma_T: I wish it really was available in paper format. I’d buy a dozen red dictionRAys! 😉 However, you should be able to read the pages if you download the high-res version which I made available on vimeo: http://vimeo.com/39456617. Wahhhh!!! I want a dictionary like that!!! I have one that is similar, but not so well adorned. I think this one would be more entertaining, and ever so much more worthwhile!!! Fantastic work, bccmee, and thanks to all who contributed!! Oooh. I need to get my hands on one of those! Great dictionary Bccmee, bravo ! @April: It seems there is a market for this book. 😀 Thanks for your contribution! Great addition to the library! I’ll be watching for future editions. This is amazing and deserves to be published bccmee. Now what can we do to make happen?? I’m happy to pitch in some cash to the publishing fund. @mersguy: LOL! It would be totally fun. 😀 You’ve given me an idea I may use for a future project…writing it down now. Thanks for your contribution! Great job, Bcc!!! THANK YOU!!! @Luciana: LOL re: pRActice. 😀 I am delighted at the number of non-English words submitted too. We can all become multilingual. Thanks for your contribution! I can’t wait for my copy! Eat your heart out Merriam-Webster! Wonderful work Bccmee and everyone! Love it! I love your ideas and creative teaser texts !!! Thank you, bccmee!!! @cdoart: I’m delighted you enjoyed our team effort. How hilarious if Richard Armitage actually narrated a dictionary, LOL! Thanks so much for your lovely contributions! Thank you, Bccmee, and all writers! Fantastic collective work. Can I pre-order the audiobook right now, please? @Fabi: *giggle* I would love to hear a new audiobook read by RA. 😀 Thank you very much for your Portuguese and English contributions! I LOVED THIS!!!!! Brilliant, just brilliant! I love the Pret a Porter page…..Ready…Willing…Able! Yeah, baby!! Wonderful entries, everyone! You’re a creative genius, bccmee! Bravo!!! Never learn a new language was so delicious!!!!!!!!!!!!!!!! @Margie: LOL, I’m guilty of the trying to catch each word too. 😀 The submissions are so clever and I couldn’t have thought them up myself in a million years. Thanks so much for your contribution too! @Bettina: Have to confess, I would definitely keep a copy of this book by my bed if this dictionary was real. 😀 I’d want this within reach wherever I went, LOL! Thank you kindly for your contributions! Hilarious! You topped yourself again, B! Oh, I want one!!! Obviously, I will need also the audio book and practical exercises. =) Thanks to your efforts, my English will improve a lot …. @vec170203: We could learn a lot of Richard Armitage-related words together in several languages, LOL! Thanks for your kind words of support! This turned out fantastically! I want this dictionary! Is there any way for us to actually download the pages of words and pictures so that we can enjoy them more slowly? I have goofy eyes. @Gratiana: Since I created the pages in Adobe After Effects, there’s no simple way to capture the pages. However, if you download the MPEG version from vimeo, you should be able to pause and read the content. 🙂 Thanks bunches for your contributions! @Jonia: Haha, yes, we are rather well-read, aren’t we? 😀 Thanks for your comment! I WANT IT!!!! NOW!!! FOR EVERY ROOM IN MY HOUSE!!!!! Bccmee, thank you and everyone who contributed; this is absolutely brilliant!!!! Have to watch over and over again to catch all the wonderful details. Yes, I want one too! A must-have and compulsory reading from now on. I love this project. It is a really good idea. I really liked the comment that said, “Read this every day until it’s worn out. Then buy a new copy.” Hehe. The dictionary is good not just for those who are cRAzy for RA. It’s good when one is cRAving some RA time. @Brooke: Haha, glad you liked the dictionary and that blurb in particular. Thanks for your support! I WANT ONE!!!! Thanks to everybody who contributed. Great result. @titianminx: Mmm, if only it was real. Any publishers out there listening? 😉 Thanks for your comment! I love it! I would love to have one for real! Would definitely buy it! @Ania: Big thanks to you for your Polish entries! I’m so delighted you enjoyed it. I appreciate your contributions very much! The book is lovely!! But hey it’s not for sale?? What a shame! Would be nice thing for charity or something? Or copyrights don’t allow? @jacqui_coinyard: A charity sale is a bRillAnt idea! Maybe someone will make it happen. 🙂 Thanks for your contribution! This is so creative and funny ! well done bccmee, you are brilliant ! LOL! it was a great fun and a great “pleather” ! ; ) and the result is fantastic because of you ! This is Brilliant! I A-dored it! I´m cRAzy to get this dictionary.You are a genius, did you know? Thanks for this wonderful acquisition,Bcc.I´m going to download it right now!Have a gReAt weekend! I downloaded it in mp4 and the resolution is great. I’ve managed read everything. Fantastic job, Bcc!I enjoyed very much to participate of this project and I hope can participate the next one too. You’ve outdone yourself with this one, for sure! So fun and brilliant! Thanks so much for letting us all contribute! I think the link should be sent to Richard’s agents for forwarding to him, don’t you? 🙂 Well done, clever, clever you! @grendel’s mum: I want to use all these words daily, LOL! Thanks for your support! Finally got around to watching this on Vimeo and stopping at every page so’s I could read the text and have a good look at the pics. What an absolutely fabulous job you have done on this bccmee, now all that has to be done is to get it into print!! @Mezz: Yay I’m delighted you were able to stop and smell the words & pictures, LOL! 😉 Thanks for your lovely comment. This is so well done. All of you who created those words and definitions are amazing and have great humor! Haha Just had the fab idea I could turn the front and back covers into custom skins for my iPad until release of print and audiobook! This is great fun. It would be a hoot to have a hard copy. Tks for the laughter! @sloan: Thanks for your comment. I can totally visualize a hard copy; it would be awesome! Can this please be someone’s next project to turn it from online reality to actual reality. I would love a hard copy too. An RA publishing company would have many interested investors. Bccmee you are so wise to know that no RA dictionary would be complete without pictures as we are never too old for picture prompts. Thank you.